This square is the commercial and administrative centre of the city as well as the site of important social and historical events. Here you'll find cinemas, theatres, banks, hotels, restaurants, dozens of small and large shops, and administrative centres. The square was created during the founding of the New Town by Charles IV in 1348. Today it is dominated by the National Museum (1885 – 1891) and Josef Václav Myslbek’s statue of the national patron St Wenceslas from 1912. The grandly conceived square originated at the New Town establishment by Karel IV in 1348. It is 750 m long and 63 m wide in the upper part and 48 m wide in the bottom part. Within a few years, houses and workshops of craftsmen, malt houses and breweries were built around the assessed area. The square was called the Horse Market, as it was intended for trading horses, and in addition to the sale of various agricultural products. Later cots were built at the bottom of the square for sale of saddler’s and case goods, fabrics and spices. Markets took place here till 1877. Also executions were held at the market place; gallows stood both at the bottom and at the top of the square. In the bottom part called Na Můstku there used to be a pond with mill; public well stood in the middle of the square and later in the axis of the square three fountains were built. By the end of the 14th century Horse Gate or Gate of St. Procopius was built as a part of the fortification wall at the place of today’s National Museum; the gate was demolished in 1875. In 1680 the Baroque statue of St. Wenceslas by Jan Jiří Bendl (now at Vyšehrad) was built at the mouth of Jindřišská Street and later the Baroque statue of Jan Nepomucký with the angels by an unknown sculptor was built opposite today’s Opletalova Street in 1727. Both statues were removed in 1879. A statue of the patron saint of the Czech lands used to be a place where inhabitants of Prague assembled at important moments. After one such meeting of people in 1848 Karel Havlíček Borovský suggested to rename to the Horse Market to the St. Wenceslas square. In 1786 Czech patriots opened the first Czech theatre called Shed (Bouda) near the middle fountain, where performances were played in the Czech language. It was demolished in 1789 for interfering with traffic. Soon the square was paved with pebble boulders, known as "bull’s eyes". In 1865 gas lighting was installed there. Gas lamps were installed in rows along sidewalks and from 1868 massive iron lampposts with lamps were installed in the middle axis of the square designed by architect Aleš Linsbauer and sculptor Eduard Veselý. 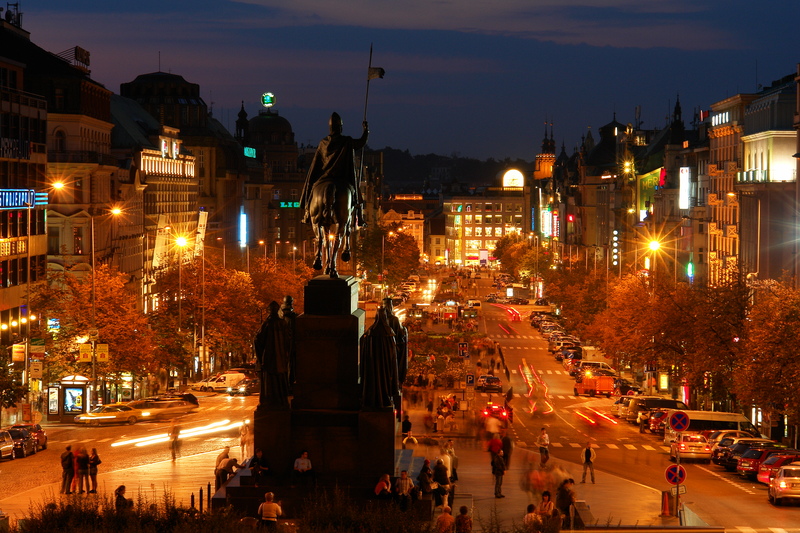 In 1895 electric lighting was permanently established at the Wenceslas Square. In 1890 the large building of the National Museum (see separate document) was built on top of the square and has been its dominant till these days. The square was initially without green and trees. In 1876 four rows of trees (sycamores etc.) were planted in the lower part of the square and 6 rows of trees were planted in the upper part. Many of them soon died, and so in the middle of 1890s the director of the Prague parks, František Thomayer replaced them with green lime trees which were planted along the sidewalks. Today, silvery tomentose or lindens, which are more durable, grow at the square. There are more than 150 of them. In 1884, the first tram came across the square, still drawn by horses. Its route led from the Na Můstku across the square to Vinohrady and the Nusle stairs. The first electrical tram drove on rails, relocated to the sidewalks in 1900. The trams provided the transport across the square until 1980. The last tram was the night tram number 22 on 13 December of that year. After removing rails number of ornamental shrubs, grasses and flowers were planted here, and in the 1980s an extensive pedestrian zone was adapted in the lower part of the square. Near the statue of St. Wenceslas a promenade was built. From 1912 to 1913 the Statue of St. Wenceslas by Josef Václav Myslbek was built at the top of the square. Saint Wenceslas, the patron of Czech lands, witnessed many famous and tragic events in the modern history of the country and the people of Prague. 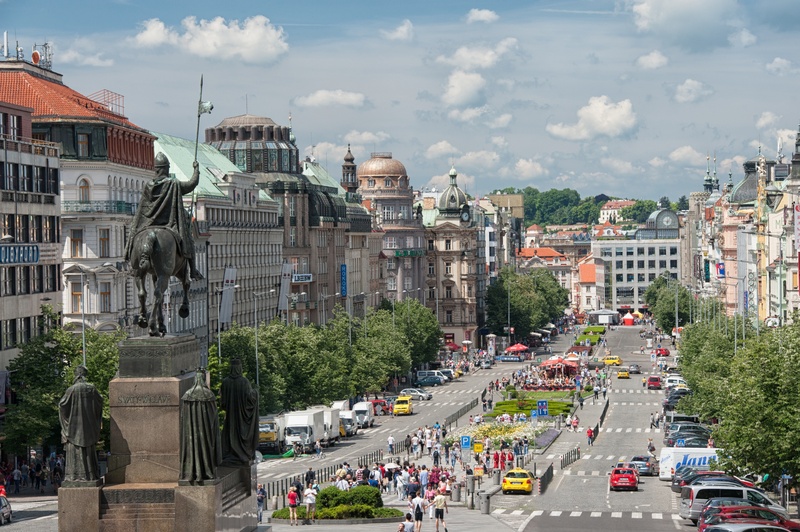 Likewise, Wenceslas Square has always been and still is primarily a natural centre of Prague New Town inhabitants and Prague citizens in general. After the World War I, it became the place of the brisk construction activity and especially after the formation of Greater Prague in 1922 the most luxury houses, banks, shops, hotels and restaurants were built at the square as well as in major streets that crisscross the Square – 28. října Street, Národní Avenue and Na Příkopě Avenue. Therefore, this social and business centre was named Golden Cross. After the World War II three gap sites at places of former houses destroyed by bombing in 1945 were built up: The House of Groceries, Jalta Hotel and the House of Fashion were built there. In the second half of the 20th century three underpasses were built there in the association with the construction of the City Metro. The quality of the first underpass built in the middle of the square in 1968 was checked just before the opening by Soviet tanks during the Soviet invasion. The underpass project was prepared by Ing. Jaroslav Strašil and associates. In August 1978 the underpass was connected with the Můstek Metro Station via escalator. Underpasses in front of the National Museum and Na Můstku were built and opened simultaneously with the commencement of operation of the A Metro line in 1978. The Na Můstku underpass with seven exits is the largest one, and it includes – in addition to the pedestrian underpass – also a large vestibule leading to the metro A and B station; three buildings had to be demolished due to the construction of metro: the building at the corner of the square and the so called Mouse Hole, where the House of the Hungarian culture was located, the Na Můstku house and a house in Provaznická Street. In 1848 the Mass was celebrated at the Bendl’s St. Wenceslas statue for good results of the mission of the Czech deputies, who - accompanied by Prague citizens – were to leave for Vienna to submit their requirements to the Emperor. A few months later, a famous Mass was celebrated here on the occasion of the Slav Congress and a few days later, Jan Arnold said another famous mass at the time of the beginning of the Whitsun uprising, when barricades were built and Prague was cannoned. In 1905, a big demonstration for general voting rights was held here. In 1914, Czech regiments leaving to the war were marching here. Those that had created legions were officially welcomed back here again. On 28 October 1918 the Czechoslovakian state independence was declared in front of the Myslbek´s St. Wenceslas monument in the wording of a deed read by Alois Jirásek. Below the statue memorable numbers are engraved in broadstones – 28.10. 1918. In 1939 the establishment of the Protectorate was established here. In 1942 assembled citizens swore their allegiance to the German empire. In 1945 the end of the World War II and the nationalization of large industries and banks were announced there. On 25 February 1948 a large gathering of people supported the communists and the "victory of the working people" was announced to present people; this event started the phase of the totalitarian communist regime. In January 1969 in the upper part of the square student Jan Palach and later student Jan Zajíc burnt themselves to death to protest against the invasion of Warsaw Pact troops into our country; in August of that year the demonstration on the first anniversary of the invasion was brutally scattered. In November 1989 large gatherings at the square started the so-called Velvet Revolution that ended Communist totalitarian regime in the country. In the biggest demonstrations an attendance of 250 000 people was estimated. - Former House of Groceries (No. 59) was built in the style neo-Greek revival style from 1954 to 1957 by architects Maximilian Gronwaldt and Jiří Chvatlina in the gap after the house destroyed by bombing in 1945. In the 1990s the separate entrance to the department store from the Muzeum Metro subway station was adapted. - Jalta Hotel (No. 45) was built from 1955 to 1958 by architect Antonín Tenzer in the style of neoclassicism of the 1950s as a six-floor building with a hundred rooms, café and restaurant with a terrace on the square ground. Also this house filled the vacant lot after the bombing. The building is an example of postwar architecture, the so-called socialist realism. - Building (No. 43) was built in 1928 for the Prague stock printer on a deep narrow plot according of the project by Mr. Boh. Bečkay. In the centre of the purist façade of this eight-story building there is a passage, where an access to the Apollo Movie Theatre used to be. It was established in 1947 and later renamed to Jalta. - Letka Palace (No. 41), formerly Avion, with the Luxor shopping mall, with a café, restaurant and Letka cinema was built in the style of individual constructivism according to the project by architect Bohumír Kozák in 1926. Today it is known as the Palace of Books. The Passage is connected with the passage of the neighbouring building No. 43 and debouches to Opletalova Street. - Družba Department Store (No. 21) was built on the corner of Jindřišská Street from 1971 to 1975 in the international style according to the project by architects Milan Vašek, Vlastibor Klimeš and Vratislav Růžička. Originally it served as a center of the Czech Union of Production Cooperatives, in the 1990s it was known as Krone department store and currently Debenhams operates here. The rooftop café octagon-shaped tower is the most striking feature of the building. - Neo-Baroque Palace (No. 19) built in 1895 according to the project of architects Osvald Polívka and Bedřich Ohman originally built for the Assicurazioni Generali insurance company. On the facade of the building there are stone and bronze sculptures by Stanislav Sucharda, Bohuslav Schnirch, Antonín Procházka, Čeněk Vosmík and František Stránský. Along Jindřišská Street a passage was subsequently broken. In the palace the Office for Standardization and Measurement and the Polish Information and Culture Centre resided for many years. The massive building stands at the site of a late Renaissance corner building with a tower and the rugged gables from the early 17th century, called The Imperial. - Prague Palace (no. 17) is a constructivist building with the movie theatre of the same name built in 1926 to 1929 by the architect Rudolf Stockar. The passage to Jindřišská Street leads through this house with predominantly glazed facade. - Former Darex department store (no. 11) was remodelled in 1994 – 96. During the archaeological research prior to reconstruction foundations of the house were discovered where Dr. Matyáš Borbonius, the famous physician of Emperor Rudolph II and Matthias lived and had his pharmacy at the turn of the 16th and 17th century. Formerly the house used to have various names, whereas the most famous was U Tůnských. The Darex name originated at the time, when high officials of the Communist regime had the opportunity to purchase the commonly unavailable goods intended for exports using special goods vouchers. Today, after the reconstruction only the listed neo-baroque facade from 1893, which is attached to the pillars made of concrete and steel, has been preserved. The rest is the modern new building designed according to the project by the architect Peter Pivek. The house has 9 above-the-ground floors and commercial office space with 4 luxury apartments in the attic and 3 underground floors with 62 parking spaces for cars with their own lift from the pedestrian walk. In the basement there is also a mini exhibition of archaeological finds discovered at this place. There is an internal atrium across all floors with two panoramic lifts. The new roof is covered with special glass with thermal treatment and in the middle there is a balcony with spectacular views. - The Golden Goose Hotel (no. 7) was built in 1910 according to the project by the architect Matěj Blecha. It is the late Art Nouveau building with a yard wings and the passage. The interior was modernized in 1912 by architect Ladislav Machoň. - Ambassador Hotel (No. 5) is the concept of an individual building with oriental features, built in 1912 by architects Richard Klenka z Vlastimilu and František Weyr. The building with the passage has a reinforced concrete structure. Until 1924, the hotel was called Passage and included Pasáž cinema and also was known for its Alhambra cabaret. - Building of the former ČKD, which visually closes the square in the bottom part and is located in the heart of the Golden Cross has the address Na Můstku 9. In the past, the At the Golden Unicorn House was situated here and from 1902 the largest department store in Prague with silk fabrics owned by Efraim Löbl was here. The new building in the postmodernism or neo-functionalism style was completed in 1983 according to the project by Jan Šrámek and Alena Šrámková. The asymmetric curved roof extension with the boiler room, decorated with a large clock, under which the observation café with a terrace with an unusual view of old Prague and the Prague skyline used to be here, is really impressive. After the reconstruction for a foreign company in 2004 only offices and some shops on lower floors will be left here. - The House of Fashion (No. 58) was built from 1954 to 1956 at the place of a bombed house on the corner. The department store was designed by the architect Josef Hrubý in a style of the sober neoclassicism of 1950s based on the tradition of the pre-war functionalism. The vertically structured facade is covered with marble; on the 1st floor above the entrance there is a sandstone relief by sculptor Bartůněk as an allegory of the textile industry. - On the opposite corner there is the palace of the Phoenix Insurance Company (No. 54 and 56), the purist office building from 1928 to 1930, one of the first constructivist buildings in Prague by the architect Bedřich Ehrmann with the facade designed by architect Josef Gočár. The palace occupies the entire block between Krakovská and Ve Smečkách Streets; on the ground floor there is a shopping mall in the shape of the letter T, from which the entrance leads to the famous Blaník cinema. The shopping mall vestibule is decorated with the mosaic according to cartons by Rudolf Kremlička. - Na Košíku apartment house (no. 52) on the opposite corner was built in 1880 according to the project by the architect Josef Schulz in the Neo-Renaissance style. - A large bank Palace (No. 42) on the corner of Štěpánská Street was built from 1920 to 1931 for Investiční banka according to the project by architect František Roith. Previously, there used to be the famous U Primasů brewery there. - the Melantrich Building (no. 36) was built between 1911 and 1912 according to the Project by the architect Bedřích Bendelmayer as Star Palace (palác Hvězda) in the late Art Nouveau style. The facade is decorated with paintings by Vratislav Mayer. The court building of the printing plant was built a bit earlier according to the project by Josef Vaňha. In the building there used to be the Čas cinema with nonstop screening time, and later Hvězda cinema, also accessible from the Rococo Theatre passage. On the balcony of Melantrich speakers and singers alternated during demonstrations against the communist regime in November 1989. - Palace of former Česká banka (no. 32) on the opposite corner, later known as Ligna Palace, is a large five-storey neoclassical building dating from 1914 to 1916, built by Josef Sakař and Osvald Polivka. Before the U Lhotků Renaissance house stood here with a corner tower and interior paintings by Josef Navrátil, which were partially removed before the demolition and deposited in the Prague City Museum. The sandstone sculptures on the facade and the relief of Mercury in the gable of the palace are the works by Bohumil Kafka. The building of the palace, stretches all the way up to the Světozor passage in Vodičkova Street, which was connected with the passage of the Alfa Palace in 1929. In 1947 the building was remodelled by architects Karel and Jaroslav Fišer, who also adapted the cinema, accessible from the Světozor passage. - Adria Hotel (No. 26), originally At the Blue Shoe House is one of the oldest houses in the square, built on the site of two Gothic burgher houses with the preserved cellars. Before 1789, it was adapted in the Classicist style by the architect Josef Zíka and in 1911 the house was rebuilt by Matěj Blecha for Adria Hotel. Its three-story facade with attic in mansard roof is a neo-Baroque. The house used to be theatre, where Emil Artur Longen, the actor and director played and worked. The wine bar in the basement used to be equipped as a stalactite cave with the sculptural decoration representing the Hades underworld and the Styx River with Charon ferryman and other figures of Greek mythology. - Juliš Hotel (no. 22) was designed by the architect Pavel Janák. The Courtyard wing in the late Cubism style is from the years 1922 to 1925 and the main functionalist building was built in 1932. The façade surface has been made of a mix of glass and steel. In the second half of the 20th century the hotel was known by the name Tatran, as well as former local cafe, bar and patisserie. The passage led into the former Paris cinema. The rear facade of the building leads to the Franciscan garden. - Former Družba Hotel (No. 16) was known before 1989 for its buffet and Tabarine wine bar on the ground floor. The five-storey building was built in 1926 to 1927 according to the project by the architect J. Jerolím. In 1990s the house was reconstructed for the exposure of Česká spořitelna. The facade is fitted with two sandstone female characters by Břetislav Benda. - Peterka´s House (No. 12) belongs to the early works by the architect Jan Kotěra; it was built in 1899. The narrow frontage of early Art Nouveau style is decorated with stucco by Josef Pekárek with floral motifs and sculptures by Stanislav Sucharda, while commercial and residential interior spaces are already modern. - Adam’s pharmacy (No. 8) is essentially a block of flats where elements of historic architecture on lower floors are combined with Art Nouveau architecture and even modernism and cubism. The structure of the attic and cupola has maintained its original appearance. The building was built between 1911 and 1912 according to the project by the architects Matěj Blecha and Emil Králíček. The tradition of the pharmacy on the ground floor has been maintained till these days. - Baťa Department Store (No. 6) is one of the most important buildings of Czech functionalism. It was built between 1928 and 1929 according to the project by Luděk Kysela in the cooperation with the project office of Baťa works in Zlín. The seven storey building extends with the rear façade to Jungmannovo náměstí and is passable. At the time of its building it was an example of the most advanced department store in Europe and one of the most important buildings of the Czech functionalism. - Lindt´s House (No. 4), also known as Astra Palace was built for the businessman and industrialist Lindt as a business and office house in 1925 – 27. It was designed by Ludvík Kysela and was the first functionalist building in Prague. It was characterized by light façade with a narrow parapet facade and huge belt window areas. On the first floor there was the Astra cafe and in the basement Carioca wine bar was founded in the 1930s decorated with historicist pseudo-rococo stucco decoration by Berlin architect Paul Sydow. Passage passes through the middle of the ground floor that links Wenceslas Square with Jungmannovo náměstí. The building is connected to the operation of the Metro underpass. Astra Palace was the corner house for many years. - Euro Palace (No. 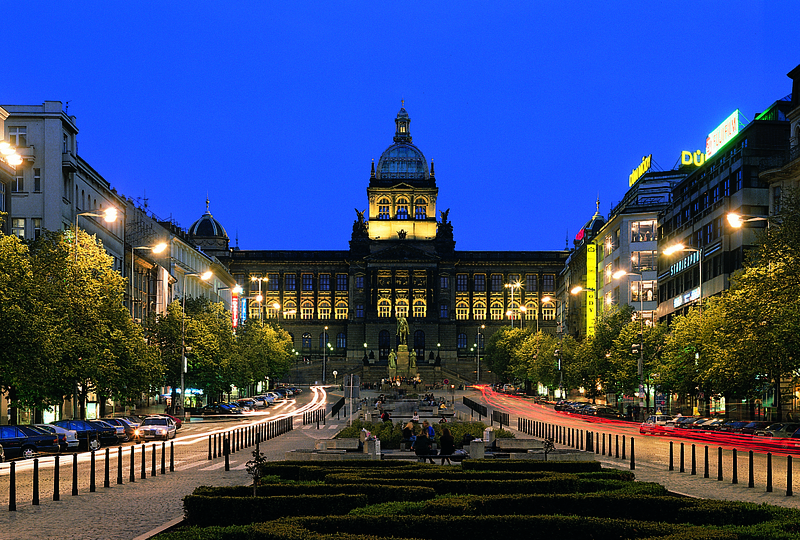 2), opened in 2002, visually closed the left part of Wenceslas Square. After many years, it replaced the earlier corner building adjacent to Astra Palace, which was demolished in 1973. The nine-floor commercial and office building is also known under the name of Astra II, to be distinguished from the Lindt’s Astra Palace I. The whole building has a glass enclosure and is closed as a tower on the 8th and 9 floors. The authors of the project are: Richard Doležal, Petr Malinský, Petr Burian, Michal Pokorný and Martin Kotík. The building won the famous architect Mies van der Rohe Award, awarded by the European Union.